SHE was down five break points in the opening game of her first round against Varvara Lepchenko at the Brisbane International, but that was as challenging as it got for Serena Williams yesterday. The world No.3 went on to easily dispose of her countrywoman 6-2 6-1 in just an hour. 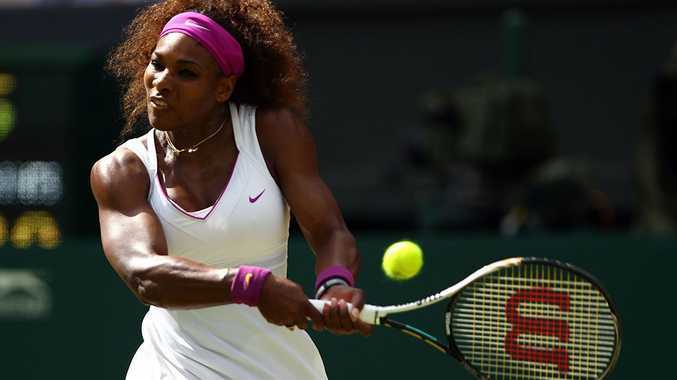 It was a welcome relief for this year's Wimbledon, Olympics and US Open champion, who pulled out of last year's event before her quarter-final after rolling her left ankle. Earlier, Australian Jarmila Gadjosova booked herself a shot against Maria Sharapova after coming back to beat Italian Roberta Vinci 4-6 6-1 6-3. The 25-year-old was treated for injury in the first set and cried at the match's completion, which went for 105 minutes. In other results, world No.6 Petra Kvitova triumphed as expected 6-3 6-4 over Carla Suarez Navarro, while Slovak Daniela Hantuchova beat Spain's Lourdes Dominguez Lino 7-5 6-2. Poland's Urszula Radwanska beat Tamira Paszek 2-6 6-0 6-2, and Russia' Anastasia Pavlyuchenkova triumphed 6-3 3-6 6-3 the Czech Republic's Lucie Hradecka. Today's drawcard matches will see No.8 female Caroline Wozniacki take on Kazakhstani qualifier Ksenia Pervak, and 2006 Australian Open runner-up Marcos Baghdatis play Aussie Benjamin Mitchell, after No.7 Samantha Stosur faces Sweden's Sofia Arvidsson.